Sound is the best, Camera is good and performance is average. It has a premium design with the top notch and is priced at a premium level as well. Some other competitors of this phone have better features as compared to this one at a lesser price. Overall the phone ia good but the price is little bit much. Vivo V9 is stylish by lookwise. Smooth interface. Decent product. No heating problems. Display good. Rear camera however is not that good. It is good phone to be gifted to parents. For gamers and selfie addicts - not so much. The battery is a major turn down on this device. Overall the phone is good one, camera is excellent, speaker is good quality. Latest price of Vivo V9 in India was fetched online from Flipkart, Amazon, Snapdeal, Shopclues and Tata Cliq. 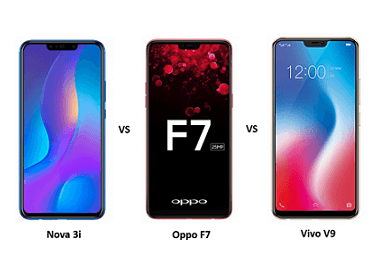 "Huawei Nova 3i vs Oppo F7 vs Vivo V9: Price, Software and Hardware Configurations Compared"